In this section we will cover the basic concepts behind photography. We will also cover terminology. In the consumer world today, the two most common camera types are Single Lens Reflex (SLR) and Point & Shoot (P&S). SLRs are generally the iconic image of cameras. When you look through the viewfinder of an SLR camera you see through the lens. The image you see in the viewfinder is ALMOST the image you will see when you snap a photo. Digital SLR cameras are referred to as DSLRs. In the film realm and on some digital P&S cameras, the viewfinder is an entirely separate optical device from the main lens. Most modern P&S cameras that have a zoom feature also zoom the viewfinder. Most digital P&S cameras offer a “live view” option on their screen which allows you to see exactly what the image sensor is seeing. If you are shooting with a film camera the image is created by exposing a photosensitive film to light. Film comes in different speeds (ISOs/ASAs). The speed of a film is a measure of how sensitive the film is to light. The higher the ISO number, the more sensitive a film is to light. Faster films tend to be grainier. To expose the film, the camera’s shutter is opened for a length of time to allow the light coming through the lens to hit the film. Shutter speeds can range from the thousandths of a second to minutes or hours. In the digital world, we have replaced film with a photosensitive chip. There are two primary types of imaging chip technologies: CCD (charged-coupled device) and CMOS (complementary metal-oxide semiconductor). Both chips work in a similar fashion to create an image. Imaging chips contain millions of pixels. Each pixel contains three sub-pixels, each sensitive to one of the primary colors of light: red, green, and blue. Depending on the chip, each sub-pixel may be able to read upwards of 60,000 shades of its color, which makes for amazing tonal reproduction. Like film, the imaging sensor sits behind a shutter. When the shutter is released, the sensor is exposed to light, each pixel converts the light that hits it to a digital sample, and the images are recorded into the camera’s memory. Additionally, like film, you can change the sensitivity of image sensors. To make the transition to digital easier on photographers, the sensitivity settings of image sensors has been standardized by using the same ISO numbering system. In theory, when you set a digital camera to ISO 200, the sensitivity properties of the imaging chip are similar to those of ISO 200 film. Also, when you move to higher ISOs in digital you start to see more digital noise. This is roughly similar to the increase in film grain. The shutter speed is the amount of time that the sensor or film is exposed to light. This is controlled by a mechanical shutter that can open and close within thousandths of a second. Faster shutter speeds (smaller fractions of a second) can freeze action in the image, but let less light through. Slower shutter speeds will let more light through, but may not be able to freeze the motion of the subject leading to blur in the image. Slower shutter speeds may also leave you vulnerable to “camera shake” which is motion blur cause by movement of the camera. Every lens has an aperture controlling diaphragm or iris. The aperture, or f-stop, is another device used to control how much light reaches the film or sensor. Lower f-stop numbers give you a wider aperture, which means more light gets through. Higher f-stops give you a smaller aperture, allowing less light through. A consequence to changing apertures is that at wide apertures you have less depth of field, and at narrow apertures you greater depth of field. In general, f-stops and shutter speeds have an inverse relationship. As you increase your shutter speed, you must decrease your f-stop to maintain the “ideal” exposure for your subject. The f-stop number is actually derived from a formula. F-stop is equal to the focal length of the lens (ƒ) divided by the diameter of the aperture (D). So: F#=ƒ/D. The scale that you see on many lenses that have f-stop rings usually looks something like this: ƒ/2, ƒ/2.8, ƒ/4, ƒ5.6, ƒ/8. This sequence is based on the powers of the square root of 2 so each stop you open up allows twice as much light in at the same exposure interval (shutter speed). Many electronic cameras (including most DSLRs on the market) will also allow you to set f-stops that are between these standards as the electronics in the camera and lenses can accurately control the aperture to even more precise settings. 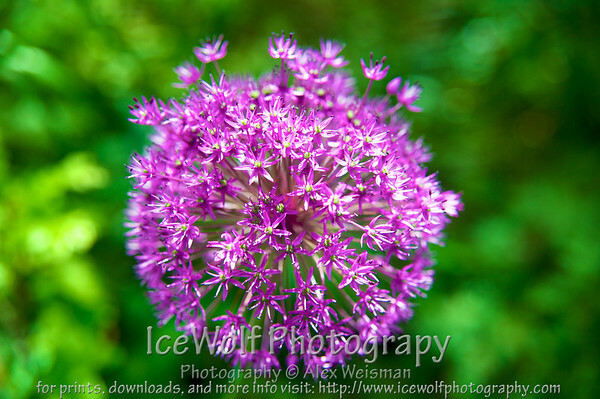 Notice how only the blossoms towards the center of the flower are fully in focus. The wider the aperture (lower f-stop number) you shoot at, the shallower your depth of field will be. 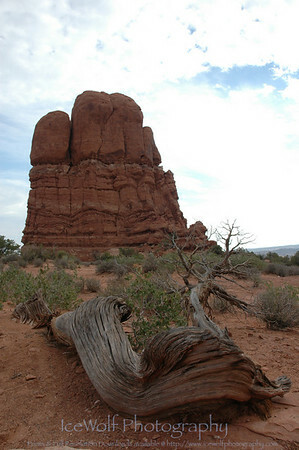 Notice that the log in the extreme foreground and the rocks way in the background are both in focus. The narrower your aperture (higher f-stop number) the more depth of field you will get in your images. Dynamic range refers to the difference between your highlights and shadows in an image. On average, the human eye can see dynamic range on the order of 1,000,000:1. What this means is that we can see details in both very bright and very dark areas of a scene at the same time. A digital sensor has a dynamic range on the order of 1,000:1. This means that if your subject is very bright compared to your background, when you expose the image correctly for your subject, you background will appear to be very dark. Conversely, if you exposed the image for the background, your subject may appear “blown out” or very bright white and overexposed. Dynamic range is something that you have to be very aware of in theatre because lighting designers love to play with it. Since theatre is designed to be seen by the human eye, lighting designers can make use of the fact that we can see a very wide dynamic range. Stages can be lit using light and dark to create textures and mood and this can be a serious challenge to a photographer. Even having a followspot on in a relatively bright scene can dramatically affect how a camera captures the image. White balance is what you do to make colors render correctly under different types of lighting. Ultimately, you set what color/shade you wan to appear as white. In the film world, white balance is controlled by the type of film you buy and/or by the use of color correction filters. The most common type of film is daylight film, which is designed with a white point around 5600K. You can also buy Tungsten film, which is color balanced for use under tungsten lighting, like theatre lighting. If you were to shoot daylight film under tungsten lighting, everything would come out with a yellow tint to it. this can be corrected by the use of an 80A full blue filter or equivalent color correction media. Color correction filters are available to correct many different films to many different lighting conditions. In the digital realm, white balance can be set right in the camera by adjusting how the sensor records the image. Most cameras have preset settings for daylight, tungsten, fluorescent, and a few other lighting conditions. Usually cameras also have an automatic setting where the camera adjusts the white balance on a shot-by-shot basis. Most current cameras also have a custom white balance setting where you can take a photo of a white object (or any object for that matter) and tell the camera to set that as white. White balance can also be adjusted in most image editing software, however you will have the most control in post production if you shoot your images in your camera’s RAW file format.